Historical objects, ancient ideas about blame/shame in the form of new objects: SCAPEGOAT IDOLS is a series of colorful sculptures that celebrate the image of the Scapegoat as one worthy of worship. The archetype of the Scapegoat is a meditation on those individuals in any culture that are scapegoated/blamed/cast away for their queer sensibilities. 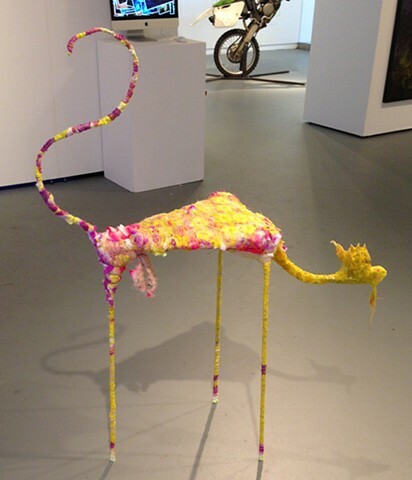 The SCAPEGOAT IDOLS are carefully made using the wrapping technique of 'Visionary'/'Outsider'/'Untrained' Artist Judith Scott --I begin by wrapping wire and thread around silk flowers, bones and other found materials.